Editor's Note: Salvation history, aside from chronicling man’s fall from God's grace and eventual redemption, is also a magnificent human saga that includes a cast of the most diverse characters of all time. There are so many stories to tell—lists of heroes and villains, saints and sinners, angels and devils—in the epic that is Christianity. One could spend a lifetime reading about them and still have only scratched the surface. This stands to reason, of course, since Christianity built the greatest civilization in the history of the world. In fact, in the midst of today's massive apostasy and Modernism-induced amnesia, perhaps telling the old stories of Christendom is itself the most effective means of evangelizing. After all, we can't do much to change a modern world that is now hell-bent on killing not only God but also everything that reminds modern men of His existence. Perhaps it is time for us to do as the early Christians did—worry less about reforming a world that is beyond reformation (humanly speaking) and more about keeping the Faith and outlasting the zeitgeist. If the world doesn’t end first, God will raise up a second Constantine to rebaptize the new pagan empire that was once old Christendom. But until that happens, we must survive. And we survive the future by keeping the past alive. We know where we must go but in order to not lose our way, we must never forget whence we came or who we once were. Thus, the old stories must be told and retold. To that end, we're dedicating more column space in the Print/E-edition to Catholic heroes, devotions, history and the telling and retelling of the great stories of the past, of saints and Catholic heroes. If we keep their memory alive in ourselves and in our children, the New World Order (or whatever they want to call their global war on God) will be powerless to de-Christianize the world completely because we, by our very existence, will stand in their way. We defeat them not by overpowering them, but by rejecting their Christophobic brainwashing, by telling better stories, by letting our grand and glorious Christian narrative obliterate their slogans and terrors for children. George Kastrioti Skanderbeg (May 6, 1405 – January 17, 1467), is also known by his Muslim name of Iskander, (Lord Alexander)." He was also known as the Dragon of Albania, and is the national hero of that country. His story is told at length in the new book Defenders of Christendom. George was the son of an Albanian lord who had been forced to submit to Murad II, the sultan of the Ottoman Empire. He was still a young boy when he and his three brothers were turned over by his parents to the Muslim empire as part of the practice of devsirme (the practice whereby the Ottoman Empire sent military officers to take Christian boys, ages 8 to 18, from their families in order that they be raised to serve the state. This “tax of sons” or “blood tax” was imposed only on the Christian subjects of the empire, in the villages of the Balkans and Anatolia). While his three older brothers were slowly poisoned when they staunchly refused to convert to Islam, George was allowed to live, as he was only a child. Forced to conform to the practices of Islam, George was subjected to merciless training at which he excelled, proving himself to be both a physically powerful warrior and eventually also a brilliant field commander. Rising quickly through the ranks, he was made bey generalissimo, and entrusted to command a large Muslim cavalry unit. The Ottoman sultan himself honored him by bestowing upon him the name of Iskander, “Lord Alexander,” comparing him favorably to the Macedonian conqueror, Alexander the Great. The Hungarian commander Hunyadi was on campaign against the Ottoman Empire when he came face to face with Iskander at the city of Nish. Unknown to his commanders, Iskander had never truly accepted Islam, nor forgotten the murder of his heroic brothers. He had also been secretly communicating with Albanian noblemen from his own country, for the Muslims had failed to erase the memory of his homeland. Upon learning of the death of his father, Iskander decided that he would join the advancing Catholic army, and fight the Turks to restore Albania. With three hundred Albanians who had been forced to serve the Turks, he defected and fought side by side with Hunyadi. Turning their swords against their Islamic oppressors, they easily defeated the Muslim army. Iskander declared war on his former masters, intending to avenge his country for the atrocities it to which it had been subjected under the Ottoman Empire. His banner displayed a two-headed eagle, an image significant to his own family, but also one that had been used by the Roman Empire. It became a well-recognized emblem in the Balkans, symbolizing the refusal of the Albanian people to submit to Islam. Several of the Albanian princes revolted against their overlords and rallied under Iskander’s banner, forming the League of Lezhe, and electing Iskander to lead the Albanian army. There was at this time a miraculous painting in the town of Scutari, which was the capital of Albania. 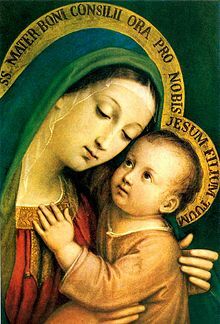 Our Lady of Scutari (aka Our Lady of Good Counsel) was an image of Our Lady holding her Divine Son which had been painted on a thin sheet of plaster by an unknown hand. This portrait was venerated and beloved by the faithful Albanian people, and as a child, George Castriota visited this shrine. It was Our Lady of Scutari who had consoled and preserved him through all his trials, and now, when he returned to Albania and dedicated his life to her, it was she who made him invincible in battle, the fearsome Dragon of Albania. Iskander’s first real test was the battle of Torvioll, which took place in June of 1444. The Ottoman sultan sent an army of 25,000 men into Albania under Ali Pasha, one of his most accomplished commanders. Iskander took 15,000 men with him to the plain of Torvioll to meet Ali Pasha, awaiting him for battle at the base of a broad slope. The field was surrounded on both sides with hills and a dense forest, appearing to give the Muslim army a distinct advantage. As soon as the armies were fully engaged, 3,000 men Iskander had hidden in the forest suddenly appeared and struck the Ottoman troops in the rear, causing a panic among the Turkish soldiers. The wings of the Albanian army turned at the same time toward the center, attacking on the flanks and doing a great deal of damage. Seeing his army crumble before him, Ali Pasha and his personal guard fled the field. Nearly every Turkish soldier was put to the sword, with only 2,000 taken captive. Of the Albanians, only 120 men were lost. All of Christendom was encouraged by the stunning victory, and Iskander was asked to join a papal alliance in a new Crusade against the Turks. Iskander was prevented from joining the Christian army through a deceitful ruse perpetrated against him by the king of Serbia, so Hunyadi ended up fighting the Ottoman forces without his assistance and were sorely defeated. Pope Nicholas V called Iskander “the champion and shield of Christendom,” which was true because the Blessed Virgin Mary protected her champion and granted him his victories. There were many more battles that Iskander fought against the Turk, alone and unaided by a thankless Christendom. With the aid of Our Lady of Scutari he remained invincible, fighting to preserve a Christendom that neglected him. In 1466 Iskander learned that the Ottoman sultan was advancing toward his homeland once again with an army of 200,000 men. He and his fellow Albanians had borne the brunt of Christendom’s battles, and it had nearly ruined his kingdom. The Dragon of Albania went to Rome seeking assistance from the pope. The pope gave what he could, but the assistance was merely financial, and not enough to meet Iskander's need. It is almost as if the world is not worthy of such men. All the members of Albania had been scourged. It remained now only for the heart to be pierced. Iskander went back to the castle of Kruje, which was then surrounded by Mehmet’s army. The siege lasted for months, with great toll on both sides. 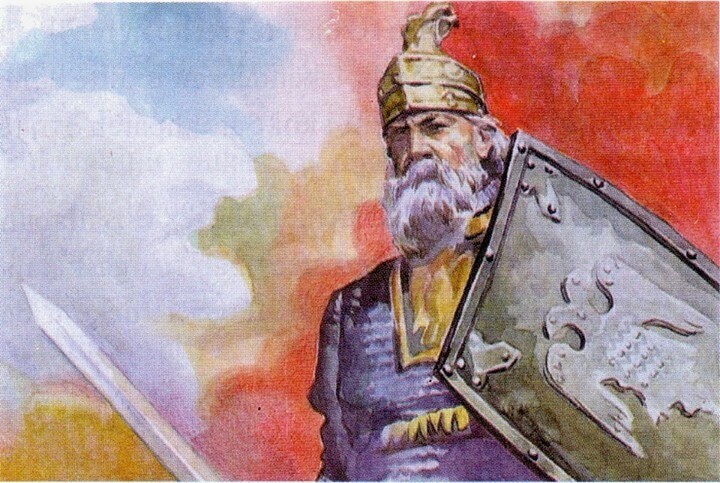 Iskander, along with his best warriors, remained outside the walls so that they could arrive at any location unexpected to antagonize and harry the Turkish besiegers. After several months Mehmet returned to Constantinople, leaving an army of 80,000 to continue the siege. With only 13,000 men remaining, Iskander attacked the Turks so violently that their leader was killed and the rest driven to a panicked retreat. Physically exhausted from his labors, and sensing that his death was near, Iskander went one last time to visit Our Lady of Scutari at her shrine, and then retired to the city of Lesh to die. There, on his deathbed, he made his last confession, and received Holy Viaticum. Mehmet had his spies in Albania, and was thus fully aware that Iskander was dying. He sent another large army into Albania to attack Lesh, expecting to conquer all of Albania once Iskander had died. The Muslims were routed and completely defeated after a bloody battle. Iskander gave thanks to the Blessed Virgin and returned in triumph to his palace. Once there, he set aside his weapons and went back to his bed where he lied down and soon gave up his soul to God. 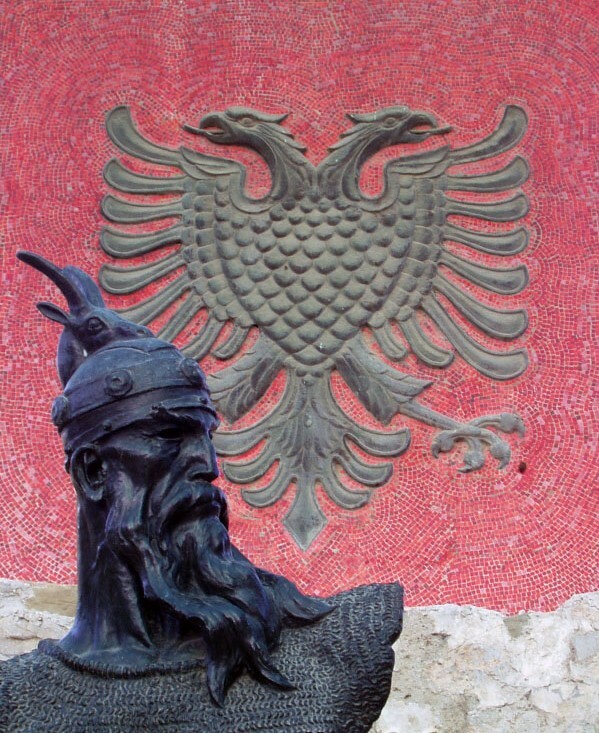 He had ended his life as a powerful defender of the Catholic faith and of Christendom, and his battle-standard became the flag of his native Albania.